It’s possible that I like puzzle games. Maybe just a bit. Their biggest advantage is that they’re easy to pick up and put back down. Sometimes, I don’t have the time or energy for a marathon gaming session, or even one of moderate length; that’s one of the reasons puzzle games are so well-suited to handheld devices, but that doesn’t mean there’s not a place for them on PCs, too. While booting up your computer is more of a time commitment than whipping out your phone, puzzlers on PC serve a similar function: they’re little nuggets of fun and challenge for your brain that are easy to walk away from if you need to. 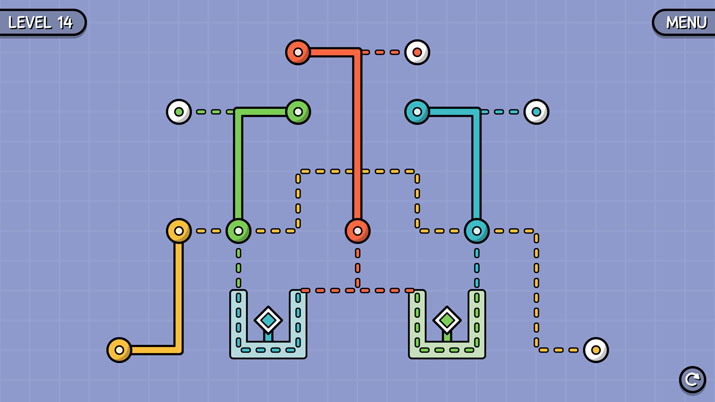 Entangle is a neat little puzzle game from developer Blake Garner. It cuts right to the chase – no story, no characters, not even any words to explain what you’re trying to do. The simple and clever design tells you everything you need to know. You’re moving little colored liney-things across paths and then docking them in a final resting spot. Line, path, goal, for fifty levels. Seems like it could get a little repetitive, right? It doesn’t. 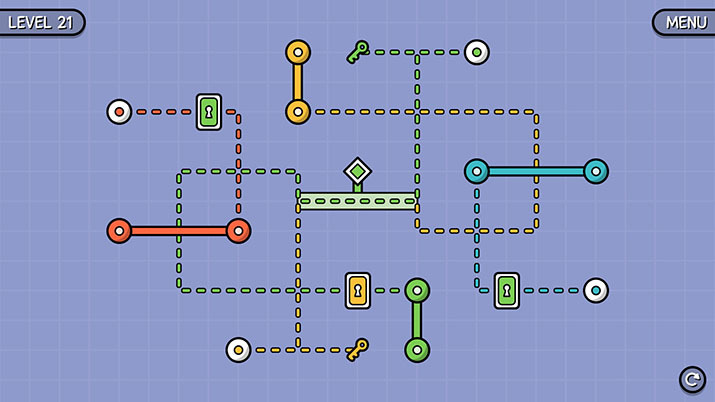 Garner has created levels that build on one another as they go along, introducing new concepts (like locks and keys) and then cranking up the complexity of the puzzles before adding even more mechanics to the mix. Entangle teaches you how to play it as you play it, without ever actually telling you what to do – a great achievement of game design. And these puzzles get bigger and tougher. I cruised through the first twenty-five or so levels while catching up on America’s Next Top Model (this season is so good, and also I contain multitudes), but the gradually increasing difficulty forced me to turn off the TV and really concentrate on the game. Whereas earlier I could just sort of push lines around until I stumbled onto the answer, I started to have to plan my moves ahead of time and envision how I’d have to manipulate the paths to get the lines where they needed to go. But not only is level design sharp, but the visuals and sound are great, as well. The music is upbeat but chill, so it encourages you to keep thinking without putting pressure on you. (Very vibraphone-y, if instrumentation matters to you.) The sound effects help Entangle feel like a corporeal puzzle instead of a digital one. Lines click along the paths and plink into their resting notches with an appreciable heft. There’s a weight to the switches that you click and the pieces of track that you turn; it feels very tactile and satisfying. Graphically, the game is clean and bright – a lot of fun to look at. And although I didn’t need to use it, I appreciated that Entangle includes a color-blind-friendly mode. Color vision deficiency is very easy to overlook in software design if you aren’t affected, so it’s great to see there was an effort to make the game accessible. Entangle is a great game. There’s only one potential drawback: its length. At fifty levels, it’s not terribly long. I still have a few levels to go, but I imagine I’ll have clocked three-and-a-half to four hours by the time I’m done. I could see people who are faster, better with spatial relationships, and less prone to distraction than I am finish it in about two hours. The value-versus-content debate is always raging in the gaming world, especially with indie developers on Steam who make smaller games while still having to, y’know, eat, but at the end of the day, how much money you’re willing to pay for what amount of content is your business. Here’s what I can tell you: It costs ten bucks to go watch a two-hour-long movie in the theater. Entangle costs less than that for the same amount of entertainment (or potentially more). And you don’t have to put on pants for it. Seems like a deal to me.